I went on a losing streak. In the space of one month, I took a rooting interest in a number of sports teams. My hockey team lost the Stanley Cup final, the basketball team I rooted for lost the NBA final, the first team I picked to root for in the World Cup (Korea) lost, then my second team (Netherlands) then my third team (Argentina), then my fourth choice (England), and then my fifth choice (Brazil) were all eliminated. Finally, in the final, the team I liked won, but it was looking pretty ugly for a little while. I'd almost like to test this out -- if any of you are into sports betting, send me an e-mail and ask which team I like, and I'll tell you. Bet against my team, and see if my bad luck continues for your benefit. As most of you know, Korea qualified for the world cup this year, and the world cup ran from June until about a week ago. There are few things which bring Koreans together like the success of Korea's people, worldwide, whether it's a half-Korean NFL player winning the Superbowl MVP (Hines Ward), or a Korean actress scoring a major role on an American TV series (Kim Yun Jin on "Lost") or even a major Hollywood star marrying a Korean (Nicholas Cage and Wesley Snipes movies are inexplicably, disproportionately popular here, because both men have Korean wives -- you can count on their films staying on screens in Korea for about triple the time other movies of similar quality would survive in cinemas). All this considered, when team Korea qualifies for the biggest sporting event in the world, bar none, especially on the heels of their most improbable success at the the last world cup, well, let's just say everybody was on board, starting about four months before the first world cup game. On the Tuesday night of Korea's first game, I went to a restaurant right near the city center (where literally millions gathered to watch the game on mega-screens) about four hours before the game began, and staked out a table with my best friend Matt. Then, as time went by, our friends arrived, and we watched the game (all dressed in red) in a packed restaurant of rabid fans, on a projector screen. 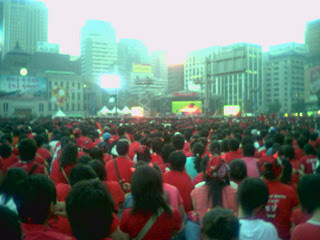 The energy there was fantastic, but at halftime, I took a stroll with three friends, down to City Hall, one of the two largest open-air plazas in central Seoul, so see the crowd, if only because I'd never seen a million people in one place at one time before, and was likely never to have the chance again without getting mauled in a riot. We walked down, took some pictures, angled around (pushing through crowds all the while), until we finally had a spot where we could see, if not the projector screens, a good large part of the crowd. Just as we got to that spot, and looked over the absolute OCEAN of people wearing red, Korea scored, and we were treated to the absolute insanity of a million people celebrating. I spent about five minutes just jumping up and down, caught up and pulled away in the pure excitement as surely as if it were a riptide pulling me out to sea. Then we went back to the restaurant and watched the rest of the game there. Korea won (its only win in the tournament) so the microbrewery where we saw the game served free beer until the wee hours. We were tired the next day at work, but all the students were exhausted too, from watching the game, so we just wrote off most of our classes and talked about soccer instead. I didn't watch the game Korea tied with France, because it started at 4am on a weeknight. However, at 6am I was woken from my sleep by shouts bursting from a large percentage of the windows in my neighbourhood, when Korea scored. The only problem was that Korea lost. And didn't even score, so I never got a chance to join the "we scored a goal" dance in the middle of the crowd. However, I've never had so much fun people watching while folded into thirds with aching knees and a sore bottom, in my entire life. The brawl for seating was entertainment enough, just on its own, to make it worth the all-nighter, and the bummer of still needing 30 minutes to pick through a crowd of dispirited red-dressed "Red Devils" freaks (that's the team's name) shuffling their ways to the nearest bus/subway/wherever two million people go when their team loses. Roboseyo lays a verbal smack-down! from a comedy website. . .
Four Songs that meant a lot to me.